… the more they totally don’t change! I got back into trading recently. I did a bunch of scans and found a few stocks that I liked. I ended up buying a couple of them. 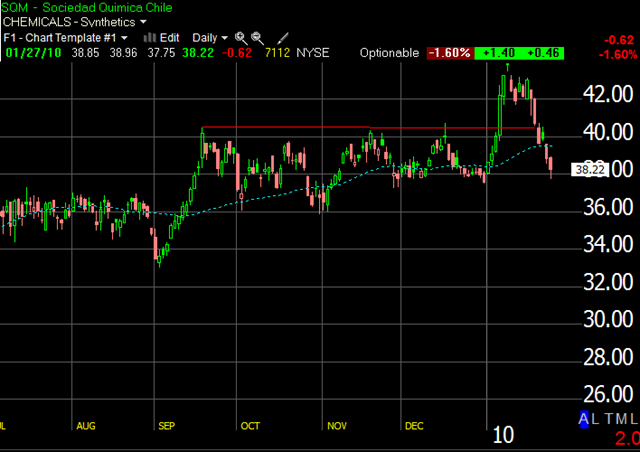 One of them is Sociedad Quimica Chile (SQM), a chemicals company. The sector is extremely strong and contains other titans like Neumarket Corp (NEU) and Braksem (BAK). I was tracking this stock for a while, waiting for it to breakout. It did so I waited for a pullback and bought at 42.40. I thought that was a good deal. Then the market decided to crash on me. Yep, I had been waiting patiently for this stock and guess what? I bought within a proper buy zone and now it appears that I am going to have to sell it and take a loss. <sigh> Frustrating. Stupid markets… why do I do this again? Oh yes… because I love it. Well, it’s now been two weeks since my second hip surgery. You might be wondering how I am doing. Well, let me tell you. I can now walk at roughly the same speed I could before. I cannot walk fast for long, or even short, periods of time. Sometimes when I am walking with co-workers and they are going too quick, I have to tell them slow down. They then say “Oh, sorry” and move at my pace. I can now also stand up straight, mostly. For the first week and a half, I couldn’t do it because when I did, I had pain in my hip/groin. But now, I can mostly stand up straight and experience no pain. However, that’s not too say I am back to normal. Rotating my leg left or right still hurts, and doing it while my leg is slightly bent hurts one heck of a lot. Twisting motions around (wherein I pivot) are still off-limits and I don’t even want to think about running. I definitely feel more sore than I remember last time, but then again, last time I was so sore I couldn’t even dance at all. So the bottom line is that I am better, but not great. I got this from the Traderfeed blog, but it’s so good I had to repost it here. "How could I have traded so poorly?" a trader recently asked me. Looking back on his performance, he was shocked to see that he had made the most elementary, rookie mistakes. "I prepared; I knew I wanted to buy if we held the lows. Why was I selling the market?" What the trader didn’t appreciate was that he prepared for the day in one state of mind, but was trading in quite another state. What he knew in one frame of mind flew out of his head once his state shifted. Although we talk about having a "self" and experience the world in a continuous fashion, our actual experience consists of a number of discrete states. We face the world in one manner when we’re energized and tap into an array of thoughts and behaviors. When we’re bored, we face the world quite differently, entertain very different thoughts, and engage in quite different behaviors. It’s true of all of us: to some degree we possess "multiple personalities". I’m one kind of father when I’m happy and patient; quite another when I’m frustrated. The thoughts and feelings I experience when I’m alone walking in a forest are quite different from those when I’m commuting to work or managing a trade. "The fact that we experience continuity in the self and yet can be so fragmented is the source of many of our emotional difficulties–and most of the problems we encounter in trading. Because of our sense of continuity, we identify with the states we are in; each, we think, is a reflection of reality…Quite simply, the ‘me’ in us–our sense of who we are–is stronger than our ‘I’–our ability to intentionally guide our actions. To the extent that we are divided, we do not have a fully free will. We are at the mercy of environments and events and what those trigger in us" (p. 184). So how do we increase our unity, our ability to sustain intention? One powerful technique is to visualize the actions we wish to take *while evoking the emotional state that we are likely to be in*. In other words, if we want to improve our consistency in honoring stop-loss levels, we should mentally rehearse stopping out of a trade while vividly imagining a market moving against us, evoking all the thoughts and feelings of being in a losing trade. If we want to raise our trading size, we should mentally rehearse putting the larger trade on, while evoking all the uncertain thoughts and feelings of taking more risk. Calmly talking about how you will handle stress doesn’t help you in the heat of the action. You have to evoke that heat and *then* rehearse how you’ll cope. It is amazing how consistent you can become if you just rehearse your skills in the state of mind and body that you will be in during game time. [tzink] This same pattern can help in becoming a better magician, athlete, or anything else you want to do. Here is a video from my trip to Peru. Very mentalist-y. The (technical) quality of the video is really good, I am impressed with the high res image. I’m still on the mend from surgery and I can’t help but think about how this compares to last year. Initially, after surgery, I felt better than I did last time. I was up and walking around the same day, and the day after I went down to Best Buy, Fred Meyer and the Apple store down at the mall. I think I overdid it a bit and I sure was walking slowly, but at least I was getting around. Last time I was quite out of it but I think it’s because I was jetlagged. I had gotten back from China only 3 days before my previous surgery and so I was falling asleep very early that week anyhow. My body’s time clock was off. However, a week after my last surgery, I was feeling pretty good. I even went dancing the next Friday, though I did take it easy and only did the slow songs. But the point is that I was not in much discomfort. That didn’t last, though, and eventually the pain killing fluid in my leg drained. When that occurred, I couldn’t dance at all. I couldn’t step backwards or sideways without experiencing a lot of discomfort. It took a few weeks to get back to a level I could live with, and even then I never really recovered as evidenced by the fact that I had to have a follow up procedure. This time, I felt better the day of and day after. However, at this time I would say I am feeling a bit worse than I was last year. It may be the bone is still sensitive because I am feeling pain in the groin area, which is exactly where the pain was beforehand. Last time, I don’t think they worked on that part of my hip bone and it was still rubbing up against the pelvis bone. If they did indeed work on it this time, then it would be natural that I would be feeling pain there. Hopefully, as it heals it will go away. They may not have fixed everything, but if it’s good enough then it is good enough. I’m also finding that with a bit of increased flexibility, I am triggering “shots” of pain. This comes when I am tying my shoes, or getting into the car. I took my second pain killer since the surgery today, whereas last time I don’t think I took any, or maybe I took one (I did take aspirin for six weeks, though, whereas this time I am not taking any other than a couple). My speed of walking is definitely way slower than it was a week ago at this time, and it feels “rubbery”. I guess I just have to wait. Finally, with all of the non-action I have been doing lately I am feeling kind of lethargic. I needed a nap Friday afternoon, and also one on Saturday afternoon. For the past month before that I didn’t need a nap even once. But my lack of movement is starting to slow me down and I am really looking forward to getting back on my feet. The other day, I performed the following trick for a friend. It fuses magic, psychology, suggestion, showmanship and misdirection. I then pushed his aside and pulled mine forward. I then took the cards out and ribbon-spread them across the table, closed the spread and then picked them up. “I’m looking for a card here, let me take this one here.” I removed a card from the spread of cards in my hands, lay it aside and then closed them up. I put the cards back in the box and put the box of cards off to the side. “Craig, look at me,” I said. “Look into my eyes and clear your mind. Do you know what this card is?” He shook his head. “Put your hand on the card.” He did as I ordered. “Keeping your mind clear now, you are seeing an image. It is smoky, dark, shadowy. You cannot see the card but you know what it is.” I looked him in the eyes. “You do know what it is. The card is coming into focus now, you cannot see the card but yet you know its identity. You do know it.” I looked at him again. “You do know the card?” I asked. He moved his hands a couple of times across the cards, finally coming to rest over the other one. He reached down, pulled one card out of the spread and pushed it forward. I picked up the rest of the cards, collapsed them and put them back into the box. I put the rest of the deck aside. I then said “Do you know what this card is, Craig?” He said yes. 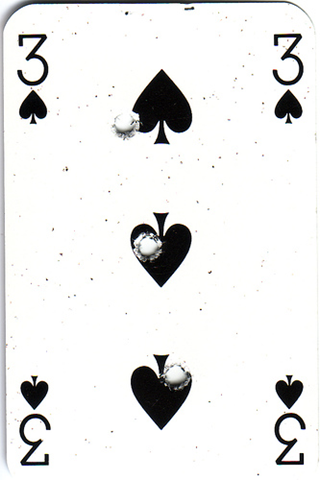 I then turned the card over to reveal the 3 of Spades. “Oh, that’s not what I was thinking of, it was black though and a low card…” he said as he trailed off. I turned over the card, my initial selection, to reveal the 3 of Spades which was the same as his selection! I then opened up my box of cards to reveal a deck of 51 cards with all of the faces different. I then opened up the box of his cards to reveal 51 cards, all of the faces different. A miracle had just taken place. My girlfriend and I met during ballroom dancing. We had known each other for a while but didn’t actually get together for 9 or 10 months after that initial contact. So, we had been somewhat familiar with each other and danced together, but that was all. Occasionally I would chat with her about other elements of her life but I do that with plenty of people. Anyhow, one of the games I invented a long time ago is listening to music on the radio and then pointing out what dance I would do to it. The key to the game is to play it in situations when you aren’t dancing, like when you are driving or walking in a shopping mall. “This is a samba,” I would say, or “This is a West Coast Swing!” The problem is that nobody every wanted to play along. My friend Frank never played along, in fact he seemed pretty annoyed by it. My brother didn’t seem interested in playing along either, although he was only marginally better than Frank. So I was pretty much reserved to playing the game alone. Until my girlfriend came along. She likes playing the game just as much as I do. We both do it, and it’s actually kind of fun for one of us to turn to the other and then say “This is a <name of dance>.” Because I have more experience playing the game – after all, I invented it – I’m usually a bit quicker on the draw. Until this past Sunday. “That’s right,” I said, “I was going to say that!” My point was that she was faster at playing the game than I was, and I was proud of that fact. She then reached over, took one side of my cheek with her hand and gave me a kiss on the other cheek, somewhat exuberantly. Just as she did that, another lady was walking by. She saw the entire thing and as she walked by us, the other lady had a rather large grin spread across her face. Clearly she was reacting to us playing the game and the public demonstration of affection. “Did you see that lady?” I asked after she passed us. I found this entire situation to be personally amusing.